In addition to its stylish new laptops and tablets, Samsung has taken the opportunity to show off what must be one of the most technologically advanced fridges in the world at CES: the $5000 Family Hub Refrigerator. The enormous, four-door smart device features a 21.5-inch, 1080p, Gorilla Glass-covered touchscreen that uses the Tizen OS to let you write notes (either with a stylus, which strangely isn’t included, or your finger), and display calendars. Samsung is hoping to provide integration with iOS and Andriod calendars through a third-party tool called Sticki. Owners will be able to send photos to the fridge’s display from their phones, tablets and computers, and can even stream music from services such as Spotify using the built-in speakers or ones that are connected via Bluetooth. You’ll even be able to watch your favorite shows on the fridge, assuming you’d want to, as the display can mirror the feed from Samsung’s smart televisions. You can control SmartThings-compatible connected home gadgets with the touchscreen, and there’ll be an option to use the MasterCard grocery application to purchase food and ingredients. There are also plans to add Instacart compatibility, allowing users in certain cities to have their groceries delivered directly to them. On the inside of the fridge, there is a pair of discreet cameras that take a picture of the contents every time you close the door. When out shopping, you can open up the accompanying Samsung app on your Android or iOS device and check the last photo taken to see what groceries you need. Samsung said it is looking at bringing Alexa, Amazon's cloud-connected AI assistant, to the fridge - giving it the same functionality found in the Amazon Echo smart speaker. 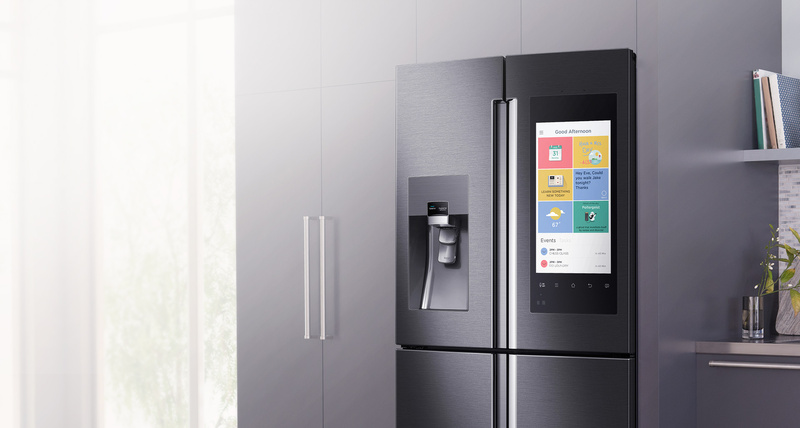 Hopefully, this smart fridge won’t suffer the same security issues as its 2014 predecessor; researchers found that they could use a man-in-the-middle attack to steal data such as passwords and session tokens from the $3600 smart device. If you’ve got a lot of money and want a fridge that’s almost as technology advanced as a smartphone, then you can buy the Family Hub Refrigerator sometime in May for around $5000.